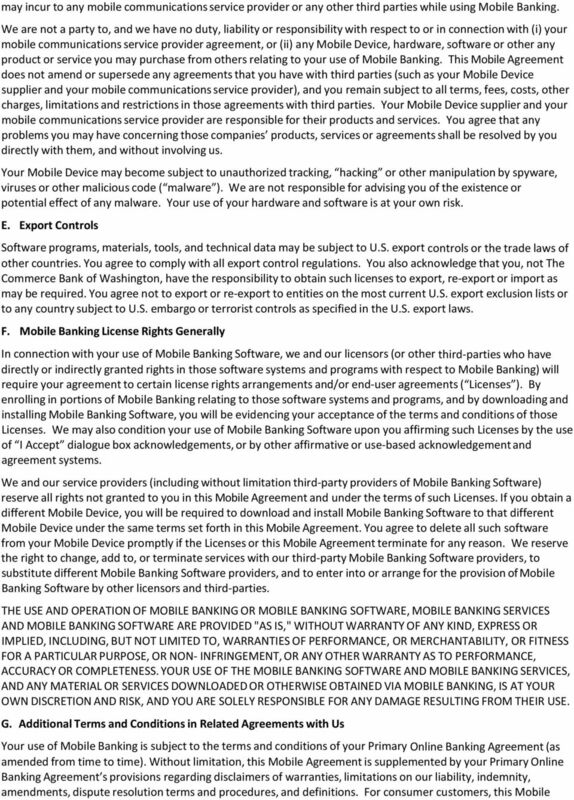 Download "Mobile Banking Service Agreement (Addendum to your Primary Online Banking Service Agreement)"
1 Mobile Banking Service Agreement (Addendum to your Primary Online Banking Service Agreement) I. 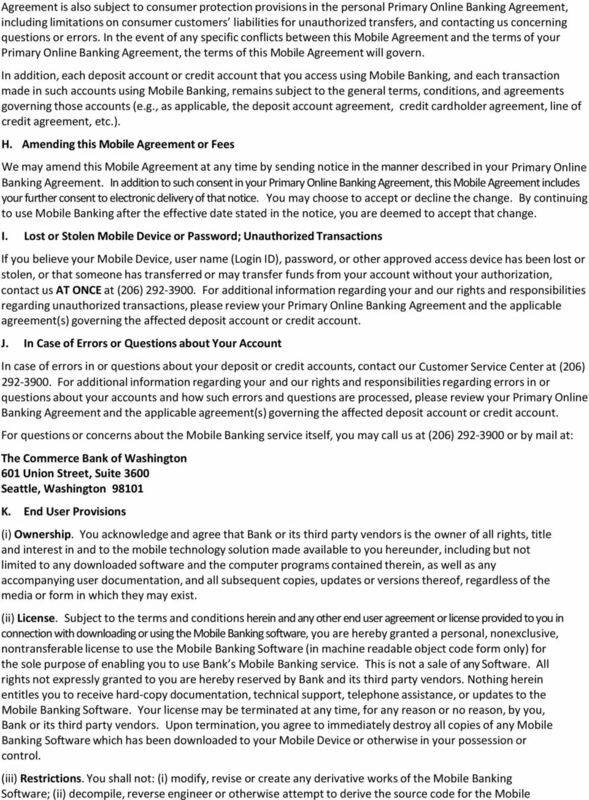 INTRODUCTION PARTIES AND DEFINITIONS This Mobile Banking Service Agreement (as amended from time to time, this Mobile Agreement ), governs the Mobile Banking service provided by The Commerce Bank of Washington (the Bank ) and your use of that service. This Mobile Agreement also includes certain licensing and end user rights and restrictions. The terms we, us and our refer to Bank. The terms you and your refer to the customer of Bank who is entering into this Mobile Agreement. ( You and your also mean any person who downloads Mobile Banking Software to his personal Mobile Device in order to conduct Mobile Banking in a Bank customer s account, e.g. an agent of a customer using his personal Mobile Device. Such person represents and warrants to Bank that he is authorized by Bank s customer to download and use the Mobile Banking Software on the customer s behalf.) The term Mobile Banking means a suite of services that we make available, enabling you to conduct banking transactions with us by using your Mobile Device. Mobile Device means a cellular telephone or similar wireless communications device (1) that is installed with software permitted by us ( Mobile Banking Software ) that you have downloaded in order to conduct Mobile Banking transactions, or (2) that is capable of conducting Mobile Banking transactions by using other protocols we may choose to permit (e.g., Wireless Application Protocol (WAP) or text (SMS) messaging). We reserve the right to change the Mobile Banking Software and other protocols that we allow for Mobile Banking at any time without prior notice. The term Primary Online Banking means the personal online banking, business online banking or treasury online banking service in which you are enrolled with Bank and includes your Mobile Banking service hereunder. Primary Online Banking Agreement means the agreement you accepted as a condition of enrolling in your Primary Online Banking service as amended from time to time. Your Primary Online Banking Agreement also includes related agreements that you have with us in connection with your Primary Online Banking (e.g., any agreement for our Bill Pay service, etc.) Other terms are defined in your Primary Online Banking Agreement. 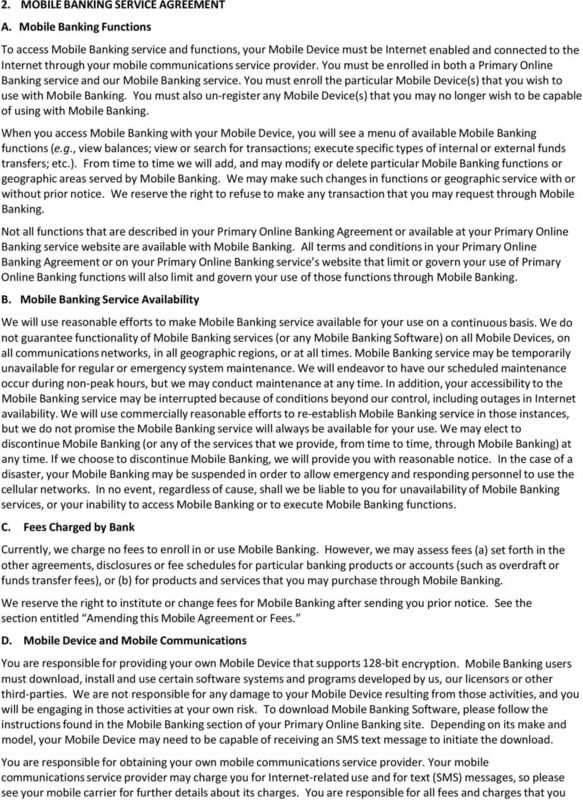 This Mobile Agreement is hereby made and accepted by you as an integral part of your Primary Online Banking Agreement. 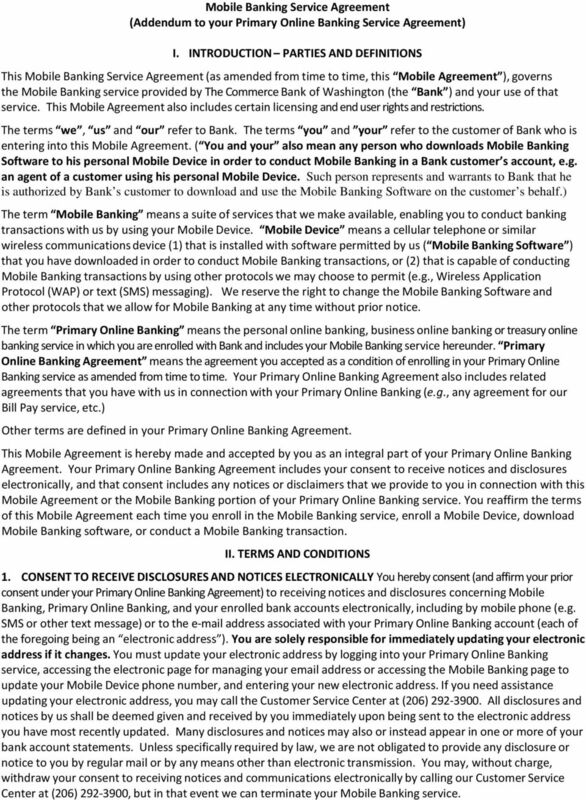 Your Primary Online Banking Agreement includes your consent to receive notices and disclosures electronically, and that consent includes any notices or disclaimers that we provide to you in connection with this Mobile Agreement or the Mobile Banking portion of your Primary Online Banking service. You reaffirm the terms of this Mobile Agreement each time you enroll in the Mobile Banking service, enroll a Mobile Device, download Mobile Banking software, or conduct a Mobile Banking transaction. II. TERMS AND CONDITIONS 1. CONSENT TO RECEIVE DISCLOSURES AND NOTICES ELECTRONICALLY You hereby consent (and affirm your prior consent under your Primary Online Banking Agreement) to receiving notices and disclosures concerning Mobile Banking, Primary Online Banking, and your enrolled bank accounts electronically, including by mobile phone (e.g. SMS or other text message) or to the address associated with your Primary Online Banking account (each of the foregoing being an electronic address ). You are solely responsible for immediately updating your electronic address if it changes. You must update your electronic address by logging into your Primary Online Banking service, accessing the electronic page for managing your address or accessing the Mobile Banking page to update your Mobile Device phone number, and entering your new electronic address. If you need assistance updating your electronic address, you may call the Customer Service Center at (206) All disclosures and notices by us shall be deemed given and received by you immediately upon being sent to the electronic address you have most recently updated. Many disclosures and notices may also or instead appear in one or more of your bank account statements. Unless specifically required by law, we are not obligated to provide any disclosure or notice to you by regular mail or by any means other than electronic transmission. You may, without charge, withdraw your consent to receiving notices and communications electronically by calling our Customer Service Center at (206) , but in that event we can terminate your Mobile Banking service. 5 Banking Software; (iii) redistribute, sell, rent, lease, sublicense, or otherwise transfer rights to the Mobile Banking Software; or (iv) remove or alter any proprietary notices, legends, symbols or labels in the Mobile Banking Software, including, but not limited to, any trademark, logo or copyright. (iv) Updates. These End User Provisions will govern any updates that replace and/or supplement the original Mobile Banking Software, unless such update is accompanied by a separate license in which case the terms of that license will govern. (v) Consent to Use of Data. 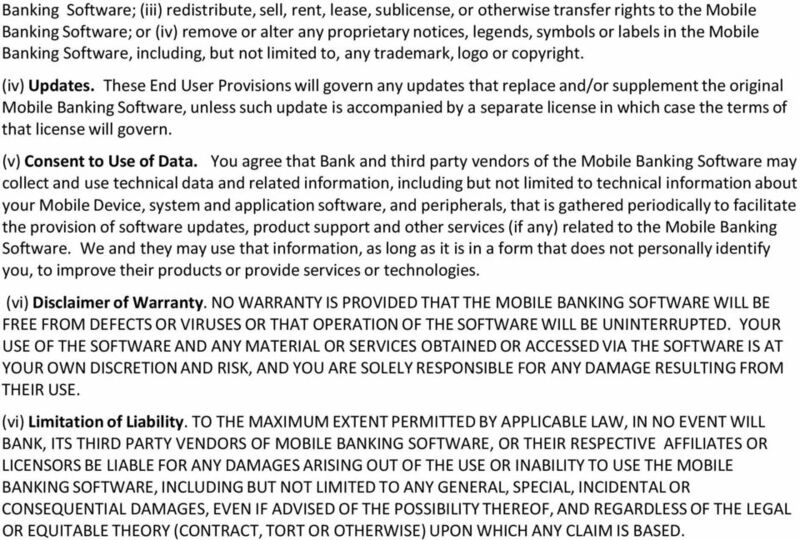 You agree that Bank and third party vendors of the Mobile Banking Software may collect and use technical data and related information, including but not limited to technical information about your Mobile Device, system and application software, and peripherals, that is gathered periodically to facilitate the provision of software updates, product support and other services (if any) related to the Mobile Banking Software. We and they may use that information, as long as it is in a form that does not personally identify you, to improve their products or provide services or technologies. (vi) Disclaimer of Warranty. NO WARRANTY IS PROVIDED THAT THE MOBILE BANKING SOFTWARE WILL BE FREE FROM DEFECTS OR VIRUSES OR THAT OPERATION OF THE SOFTWARE WILL BE UNINTERRUPTED. YOUR USE OF THE SOFTWARE AND ANY MATERIAL OR SERVICES OBTAINED OR ACCESSED VIA THE SOFTWARE IS AT YOUR OWN DISCRETION AND RISK, AND YOU ARE SOLELY RESPONSIBLE FOR ANY DAMAGE RESULTING FROM THEIR USE. (vi) Limitation of Liability. TO THE MAXIMUM EXTENT PERMITTED BY APPLICABLE LAW, IN NO EVENT WILL BANK, ITS THIRD PARTY VENDORS OF MOBILE BANKING SOFTWARE, OR THEIR RESPECTIVE AFFILIATES OR LICENSORS BE LIABLE FOR ANY DAMAGES ARISING OUT OF THE USE OR INABILITY TO USE THE MOBILE BANKING SOFTWARE, INCLUDING BUT NOT LIMITED TO ANY GENERAL, SPECIAL, INCIDENTAL OR CONSEQUENTIAL DAMAGES, EVEN IF ADVISED OF THE POSSIBILITY THEREOF, AND REGARDLESS OF THE LEGAL OR EQUITABLE THEORY (CONTRACT, TORT OR OTHERWISE) UPON WHICH ANY CLAIM IS BASED. EULA - Page 2 of 5 any service, account, computer systems or networks associated with the Internet-based services provided by ESI-TECNALIA. i. The enclosed software and knowledge base together are defined as the "Software".